When I started up my campaign, I decided to be pretty liberal with allowing players to be whatever they wanted as long as it worked within the game mechanics and didn't cause outright problems within the party. After all, we are all adults and everyone just wants to have fun, drink beer, tell stories, and roll some dice, right? So the party has always a pretty motley assortment of characters. There's the gnome rogue, the tiefling sorcerer, the tortle cleric, and the minotaur blood hunter. Actually, a minotaur blood hunter has some really good synergy, but that's not really the point of this story. The players came together really well as a party and worked their way up to level three and then it was time for our blood hunter to pick his order. As soon as he found out about the Order of the Lycan, that was the end of the discussion. He was dead set on it. Sure. That's fine. Werewolves are pretty cool anyway and if this 1/2 man, 1/2 bull wants to become 1/3 man, 1/3 bull, 1/3 wolf, then have at it. It's getting a little hard to picture exactly what that would look like, but hey, mechanically it works and I had started to enjoy the novelty of this crazy build. After all, I've never even heard of anyone playing a minotaur Lycan. Well, it turns out he wasn't thinking of a wolf at all. He had this image in his mind of a were-lizard. 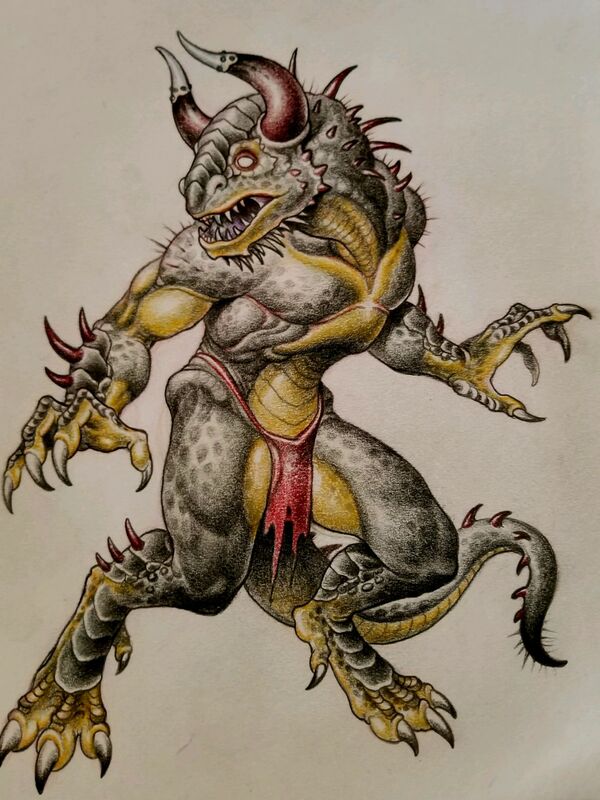 That's right, when our blood hunter transforms into hybrid beast mode, he is 1/3 man, 1/3 bull, 1/3 lizard. When I heard that, I basically just dropped my pen and started laughing. The very idea of it is as cool as it is ridiculous. Any chance of me picturing this character was well out the window. Thank god for Hero Forge because he'll never find a mini for his guy on the shelf anywhere. I told him he's welcome to do it, but he would have to take some time to write a reasonable background for his character with a description exactly what the heck he even looks like. He did one better. He drew it for me. So, without further ado, I present Beelock, the minotaur blood hunter Order of the Lycan in all his fully transformed glory. I'm just gonna steal this idea for a future encounter thanks. So my GOO Warlock is I like to think pretty brave but yeaj that would send him running and screaming, good job! that is a pretty good pic to be honest. Your friend is quite talented, and that's a concept I haven't heard of before. Well done. I would love to hear the backstory that he came up with for this. I love everything about the concept. I’ll tell you a story about Beelock from our last session. This ended up being one of the most fun encounters we’ve had so far in the campaign because it went completely sideways, and a character nearly died. A quick setup: The party had mixed it up with a group of hobgoblin cultists and they were fighting their way up the chain to get to the base and the big guys. Several sessions back, the hobgoblins sent a group of assassins after the party to catch them unprepared in the woods as the party made camp for the night. Four hobgoblins attacked from different sides while the leader lay in wait to jump out at a wounded player. That never happened. The party absolutely wrecked the unprepared assassins who had no idea who they were messing with. Beelock hulked out into hybrid form and ripped two of them apart by himself while their swords and arrows did very little to his resistant hide. The leader never jumped out at anyone. The party just assumed the leader just ran away scared. Turns out, he was taking notes. This is when the assassins mad their comeback attack. I had dropped a few hints earlier in the session about him feeling like he was being followed, but he couldn’t pin down exactly who it was. This time, they didn’t send the second-stringers. The assassins were led by none other than the same leader who was hiding in the woods the first time around. He led with four dart attacks because he’s a Hobgoblin Iron Shadow. Then a bugbear brute came charging out of the woods up to Beelock and hit him with a critical hit. 2d8 for the morning star hit plus another 2d6 because of surprise attack. Now double all of that because of the natural 20. Beelock took huge damage in a single hit as the party noticed the other three bugbears emerging from the woods. On Beelock’s next turn, he spent his action to do his hybrid transformation. His hit points had taken a big hit and he wanted that sweet sweet damage resistance. It was a trap. The assassins were not after the party. They were after him specifically and they wanted to bait him into transforming. 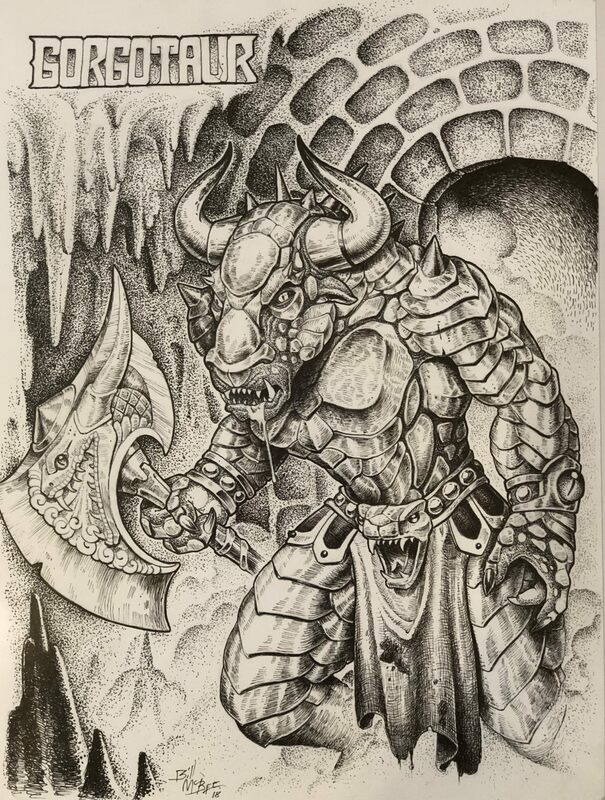 As soon as he went hybrid, all the bugbears pulled out silver weapons and went to work on him. He was unconscious before the round was over. Suddenly the party had a huge problem because not only is Beelock 30’+ from the rest of the group, he’s unconscious with a big bugbear standing over him who has not yet acted on the current round and three more bugbear ambushers who the party now realizes are all looking to finish him off. The cleric and the bard both went into life support mode on Beelock while the sorcerer and the rogue tried to deal with the guys on the periphery before they could close on Beelock and finish him off. In the end, everyone in the party survived and the second assassin team was defeated. Beelock went unconscious twice and missed one death save before it was all over. The party, who was getting ready to take out two hobgoblin sentries and bust into the base suddenly had to take a short rest to hide the bodies and administer some first aid to themselves. And now they know they need to destroy this entire hobgoblin cult before they hire a third team of assassins to make a run at them. Lol, I just made my own. Disclaimer: We are not responsible if the real Yeenoghu brutally murders you and eats your corpse.